Not Included: Airfare, gratuities for guides, hot springs fees, Lift Tickets, Ski touring gear, extra drinks, meals in cities, personal insurance and Individual transfers. 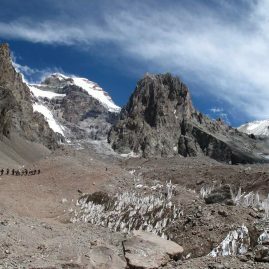 Climb and ski four Andean volcanoes over the course of one trip, options include: Lonquimay, Llaima, Villarrica, Lanin, Mocho and Osorno. Combine both single and multi-day ascents during the expedition, staying in comfortable Argentinean and Chilean lodges between objectives. Build your ski mountaineering experience with instruction and practice on fun and challenging terrain. Travel and experience the beautiful landscapes and culture of Southern Chile and Northern Patagonia. Arrive mid morning in Temuco, we are picked up at the airport and transferred to our hotel in Pucon along the shore of Lake Villarrica. Check in to our rooms and explore the city or to relax. We will meet in the evening for introductions and a brief orientation. We get an early start with a little help from an excellent breakfast. 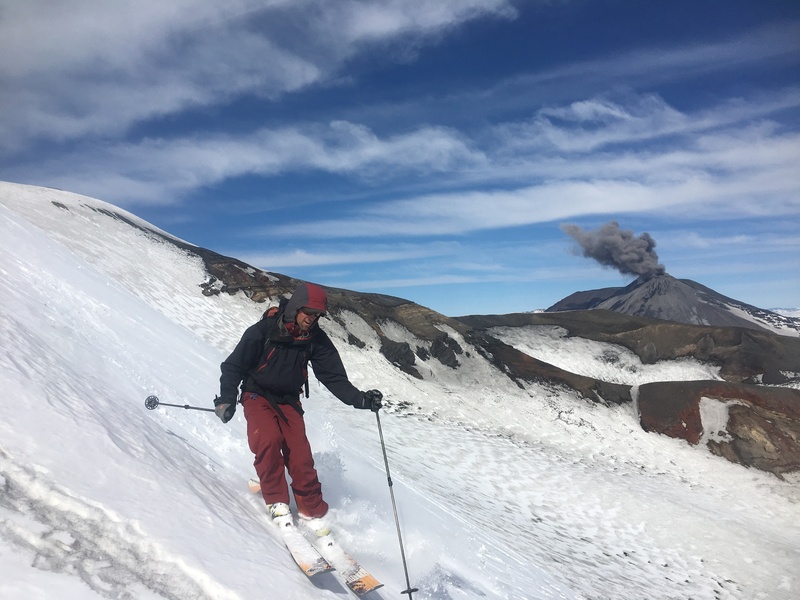 Based in a large Araucaria (Monkey Puzzle Tree) Forest, Corralco Ski Resort at the base of Volcano Lonquimay offers us easy access to begin our day, getting our legs going with some warm up runs off the ski lifts and some short touring on the southern face of Volcano Villarrica. The evening we have options to soaking our legs in the nearby hot springs followed by a well deserved homemade dinner, Southern Chile style. We drive up to and start climbing from Ski Pucon Resort. We are warmed up from our previous tours and skin half to two-thirds of the way to the summit before transitioning to boot crampons. 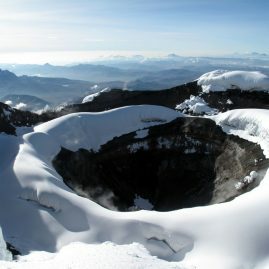 We gain 5,000’ vertical feet to the summit of Villarrica over 5 hours. In good conditions, the descent back to the parking lot takes 25 minutes! 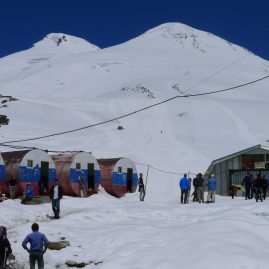 (B) We can hit the Hot Springs again or try to ski to the most famous Termas, Geometricas and pay to arrange a pick on the other side of the mountain, Chilean style! If conditions permit we go to Llaima to get high or get laps on Lonquimay. We drive up early morning start to our ski tour on the Lonquimay volcano with a mid-morning chair ride. Weather permitting, a rewarding climb to the volcanic crater takes approximately 1-2 hours. At the top the view is truly stunning. You can see 7 nearby volcanoes, and a distant view into neighboring Argentina. The descent off the top offers a constant pitch of 35-40 degrees which we can do 2 or 3 times! The evenings we have options to soaking our legs in the nearby hot springs followed by a well deserved homemade dinner, Southern Chile style. Next up: Volcan Llaima. Day 6: Llaima Summit Day -10,253 ft /3,125mWe use an early start for our climb on Llaima. Looking up at this mountain from the base, the summit looks close, but it’s an optical illusion. It doesn’t seem to get any closer but the reward is a long descent with views for miles. Overnight: Las Araucarias or back to Pucon. Day 7-11: Mocho, Puyehue, Chillan and Osorno. We follow the weather to make the most out of road time. Head North to Chillan for big days on the big peaks of Nevado de Chillan or head South to trek in on horseback to Puyehue and ski into the massive crater from the movie, All.I.Can. 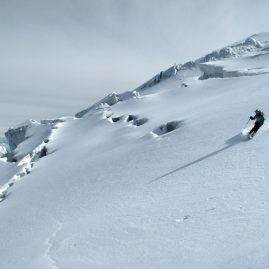 Next choose a trip far south to Osorno to rip fast turns off the region’s iconic summit looming over the Lakes District. Ride the best backcountry terrain at one of South America’s oldest and largest ski areas, El Catedral and the Frey Valley. Our travel schedule will remain fully flexible to allow us to make the very most of snow and weather conditions. Travel down the Andes takes up to 2 days so we try to maximize the next 5+ days of skiing with a balance of lift access and hut based ski tours. Starting in the city of Bariloche, we ride the lifts at El Catedral and move onto the amazing terrain of the Refugio Frey and Cerro Lopez as we our touring legs under us. In a typical day, we will gain around 2,500-4,000′ of ascent – which means we also get to enjoy a lot of riding! The snow conditions are variable, however it’s usually spring snow or fresh powder on a firm base. On occasion, strong winds can affect the snow, making it a more challenging ski descent. If the weather is poor we can always be flexible with the schedule to so you can get the most out of your visit. Arrive late afternoon in Bariloche, we are picked up at the airport and transferred to our hotel. Check in to our the rooms and explore the city or to relax. We will meet in the evening for introductions and a brief orientation. We get an early start with a little help from an excellent breakfast. We ride the chairs in the morning to warm up and after lunch explore the bowls around the boundary. 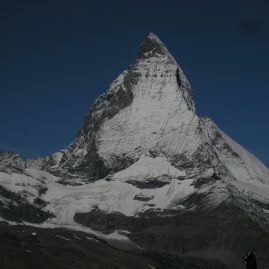 Early morning start to our ski tour weather permitting through the Van Titter Valley from the El Catedral Ski Area. The descent into the Van Titter offers numerous classic descents up to 1500′ of open bowls to tight couloirs. We skin up to the Refugio Frey and settle in for the next 3 evenings where we enjoy the amazing world class hospitality and terrain of followed by a well deserved homemade dinner, Southern Chile style. Day 6:Refugio Frey Optional extra night if conditions are good or return to Bariloche and tour Cerro Lopez the following day. Enjoy a tour back to town or explore a locals favorite up to Cerro Lopez and experience Dulfer, the legendary #alpinekitty! Take in Bariloche one last time and catch a afternoon flight home arriving mid-morning on Sunday in time to reflect and work on your humblebrag at work the next day! Ski the high peaks and amazing ski areas that surround Santiago. 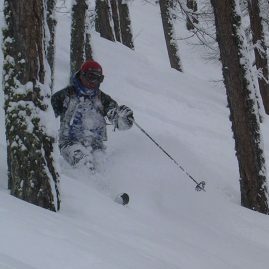 Ski the famous Tres Valles, mixing offpiste and lift served riding in the expansive alpine playground! If touring is the goal, ski the areas to acclimatize then head to the legendary couloirs of Canyon de Maipo and boot up 2,000-4,000′ lines that make this place one of the world’s great touring destinations! Our recommended clothing system has four layers. § Softshell: should be a durable, comfortable, insulating and wind/water resistant layer that breathes well. The main Softshell fabrics are Polartec Wind Pro, Gore Windstopper N2S, Schoeller and each clothing manufacturer has their own. These four layers are usually sufficient for most people, but if you tend to be colder bring one extra medium-layer that would be ideal for extra warmth around camp, such as a vest. When deciding what to pack, remember to bring enough clothes and accessories to ensure your safety and comfort, while not over-burdening yourself with items you probably won’t use. o Skis or snowboard. Skis should be equipped with alpine touring bindings or telemark bindings. We prefer split decision Snowboards w/ skins because you do not need snow shoes. o 1 Hard shell jacket with hood Waterproof and breathable. Gore-Tex or equivalent is best, roomy enough to fit over multiple layers. In Town clothing for travel and evening. o Sleeping bag Rated to at least 20º F. Line the stuff sack w/ plastic bag. o Sleeping pad 1 closed cell foam and/or ¾ length Therma-Rest for extra warmth and comfort. o Personal first aid repair kit Basics: moleskin/blister kit, Band-Aids, first-aid tape, ibuprofen, personal medications, spare parts for bindings and batteries etc. You will carry 15-30 pounds, which will include everything on the equipment list. We often get this question because most people need to know how much total time they need to take off work. Our Ski Trip itinerary specifies the day that we finish our services in the mountains so you can book your flight home.